This set includes Picture-Perfect STEM Science Lessons, 3-5 and the Picture-Perfect STEM3-5 Book Collection. This set equips the teacher with the lesson book plus the trade books that are used in the individual lessons. Would you like to use the award-winning Picture-Perfect Science series but don’t want the hassle of tracking down the trade books that accompany each lesson? 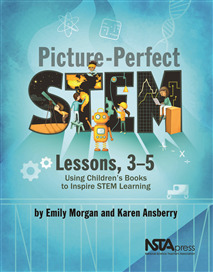 NSTA offers a collection of more than two dozen hardcover and softcover picture books used in the popular Picture-Perfect STEM Lessons, 3-5. For teachers eager to integrate STEM into their school day, Picture-Perfect STEM Lessons is an exciting development. You’ll help your grades 3-5 students engage in STEM activities while they learn to read and read to learn. Picture-Perfect STEM Lessons for the upper-elementary grades uses a remarkable variety of books to teach STEM concepts and reading’s comprehension strategies. All the books fit inside a zippered canvas tote bag with a screened image of the book cover on it. This bundled set is a great value especially compared to the retail cost (and effort) of buying the books separately. Please note that while we strive to build complete collections, occasionally we cannot find ample supply of one or more of the trade books. In such cases, we will ship the nearly complete collection to you, minus the missing book(s). If your collection is missing a book, rest assured that we are doing our best to find more stock of that book and will send it to you as soon as we can. If it proves impossible to stock the book in a reasonable amount of time, we will refund a portion of your payment. If you have any questions about the book collection, please email us at pubsales@nsta.org. •	Boy, Were We Wrong About the Solar System!